Are you perhaps searching for a party bus in Canton Township? If this is indeed the case, then your search can now come to an end. 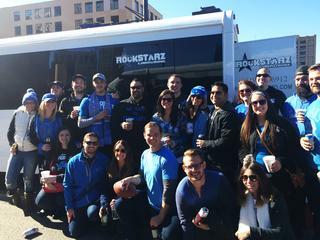 Here at Rockstarz Limousine and Party Bus, we specialize in not only delivering a stunning party bus, but also an amazing atmosphere which means your special celebrations will be even better than you had previously imagined. With your Canton Township party bus rental, one of the most important aspects is that you have more than enough space to allow everybody to be invited. With our party bus, we have sought to make the maximum use of the space that is available allowing you to bring along more guests than ever before to then celebrate with you. As soon as you step inside our bus, you will notice that everything is on hand to make sure that you have an amazing time. From the stunning stereo system that will just provide you with the correct tone to the music, to the laser light show that adds some extra atmosphere, there’s no way that you will be disappointed with the experience that both you and your guests are about to have. In the past, individuals have sought to use our Canton Township party bus service to help them celebrate a wide range of occasions. From a birthday, to an anniversary, or perhaps you just feel like getting a group of friends together in order to have a party. No matter what the reason may be, our party bus is going to be perfectly suited to help you have a wonderful time. So, if you live in the Canton Township area and are looking for a party bus, then give us a call here at Rockstarz Limousine and Party Bus. The other option is to use the contact form on our website and someone from our company will be in touch.